Working with brass requires the best equipment. Not only the tools you use need to fit your needs but where you work with these tools is crucial as well. Each reloader has its own way of working with cases, and so, each workstation is different. Now, this urges you to have the reloading bench. 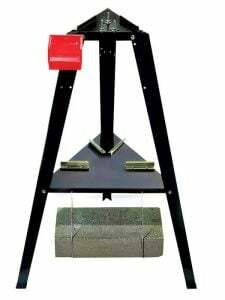 The sole purpose of having a reloading stand is to provide the perfect workstation for any user. It is not just a table where you set every component on the top. More so, it can be a complete storage for the different parts you use and a great workspace to reload brass cases. If you are an experienced reloader, you know how important it is to keep every component in proper storage and every tool organized.This not only saves time, but it also provides a safer work environment since you are working with several components that may detonate if they are mishandled. There is a wide variety of reloading benches, and a perfect one for you as well. We found the three best reloading benches on the market and unveiled them for you. As you only want the best equipment, we included a definitive buying guide too. Hopefully, this will help you choose the ideal ammo reloading bench for you. Hopkins may possibly design the best workbench for reloading cases on the market. When you are looking for a reloading bench, you are looking for a model that exactly suits your needs, right? Then, the Hopkins 90164 can prove the ideal product for you. It is great for those of you who like to customize every aspect of your workspace. This model includes a metal fitting to mount as many boards as you like. This is a great feature since you can add or remove components as you wish. Plus, you get to choose how wide the reloading bench will be as well. You can assemble it in less than an hour. The instruction manual is clear, and it guides through every step of the building process. Although you will need a screwdriver and maybe a saw to cut and customize the board, any other tools you might need are already included when you purchase this product. The overall construction of the 2×4 framing is stable and strong. Because of this, each shelf can hold 1000 pounds worth of tools, perfect for all the heavy components you need to use while reloading the brass. The components of this model are made from a durable structural resin that is solvent-resistant and impact-resistant. You can rest easy since the resin won’t get damaged if you drop any chemicals on it. Therefore, you can be sure that this reloading bench is durable and stable for better reloading. As you could imagine, this model is not foldable or easy to move. It is heavy and if you want to move it around you will basically have to tear it apart and re-build it wherever you wish to. Yeah, it is easy to assemble, but this model is not recommended if you are looking for a portable bench. Next, we have the Frankford Arsenal workbench designed for those of you with limited space to work. The feature that differentiates this model from the previous one is the adjustable and foldable table top. The rigid workstation has a 34”x21” frame. You can adjust this frame between 28.5” to 45” to fit the position in which you are reloading. This is perfect for those of you who get bored of siting down while reloading. After a while, you could just stand up, adjust the height on the frame and continue to work standing. There are two side shelves included where you can hold all those tumblers, trimmers or priming tools that were scattered on your workplace. It is a great way to have everything you need to reload your brass near you. Plus, the two containers on the sides are great to hold any loose components or tools. The entire frame is made from a corrosion resistant steel that is meant to last for years. The centerpiece of the workbench consists of a rigid and durable wood that is perfect to mount heavy tools such as a reloading press. One of the best features of this model is the fact that both the tabletop and the frame are collapsible for effortless storage. Folding the entire workbench is an easy task, and it is perfect for those of you who want a portable and easy-to-move model. Some users have had a problem with the overall stability of the workbench. Although the frame and the tabletop are sturdy, the rubbertips on the feet of the legs are not as stable as you could wish. The whole workbench can skid when it is on a smooth surface, and as you are reloading brass, you don’t want this to happen. When it comes to easy installation, this may be the winner of the contest. The instruction manual is clean, and gives detailed information on how to set the workbench to your desired heights. Plus, you can find useful information on what you can do with this model. Lee Precision is among the most popular brands when it comes to reloading. They always deliver quality at a fair price, and the Lee Precision Reloading Stand is no exception. Behind a simplistic design, many features will make the reloading process much easier. It is precisely designed for those reloaders that need to reload indoors. This simple model is perfect if you have a reduced space to work with, making it the ideal bench for apartment dwellers. It stands at 26”x24”, making one of the best options if you are searching for a reloading bench to carry around. But don’t let the short size fool you. You can mount any Lee Precision reloading press on it. Additionally, it includes two bench plate receivers, so you can mount any extra accessories or reloading presses. These shelves can be used as a storage for different reloading components as well. The three-legged design is perfect for any floor. Each leg has a rubber tip to ensure stability and sturdiness. They are 100% skid proof even on smooth surfaces. And even if this does provide enough durability, this product includes a concrete block holder on its base. The stand is made out of coated steel. This material is sturdy and durable, meaning it will last a lifetime. Plus, it can place the press at any desired height. On each of the three legs, there are eight mounting holes so that you can add any accessories on the bench. You can fully customize it as you wish, so you feel comfortable when working on it. These mounting holes are great if you prime your cases since you can mount a bucket to catch all the primed rounds after you finish with them. This model is not compactable, but because of the size, it may be easier to move around than other models. Also, the manual included is not clear. Instructions are not detailed, and it may be a little difficult to understand. If you are looking for a reloading bench with all the basics included, this may be the reloading press for you. When you buy a reloading bench, you have to make sure it will last for a long time. Most models are fairly durable, but a few of them have extra features that make them last even longer. Some materials will get deformed or damaged over time. When thinking on which model to purchase, you should check if materials the product is made from are durable and strong. Check what max weight the whole unit can withstand, and compare it to what you will be pressing on the table. It is important that the frame that supports all the weight is sturdy and robust. There are specific locations in which you may mount several reloading presses in one table, and you may know that these are not light. A sturdier frame means improved stability, which you need when working with components such as gunpowder or primers. Make sure that the whole bench does not skid, even on smooth floors. Some models come equipped with rubber tips on the legs to keep them from sliding. Another alternative can be screwing or securing the legs to the floor someway (like using a concrete block or any heavy object). Many models nowadays come with extra features to help you facilitate the process. Some come with many mounting holes, so you can add as many accessories as you want. This is extremely useful since you can have all your tools close to your workspace where they are easy to reach. Keep in mind that the more customizable a bench is, the more usage you have with it. Herein, you can set the measurements to suit your needs, and then change them if you need to. Having space for many presses or extra accessories on top of the table is also an important feature. Tools such as tumblers or priming units can take a lot of room, and to work comfortably and safely with them, you need a decent space as well. Also, it is essential to have somewhere to store your rounds or components. You will surely be working with primers, and if one of these detonates in the wrong place, it can cause considerable damage. Because of that, it is essential that you have a designated shelf or space to store these components. Some of you reloaders may be interested in other hobbies such as arrow crafting, blacksmithing or maybe fishing. 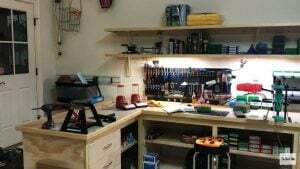 This is why you may want to look for a workbench that can adapt to all of these hobbies. The support has to be versatile and ideal for all kinds of crafting. Some frames and tabletops are impact resistant, so it can withstand every type of rough activity. And, even if you do not practice any other hobby apart from reloading, you ever know what you will have to do on the workbench. If you are always moving or have the need to reload on other places far from your workstation, you may need a portable workbench. To move most models, you would have to tear it down and assemble all the parts again wherever you want it to be. Because of this, there are many models that can fold or collapse for easier movement and storage. How do I know which press fits on the workbench? A: It mostly depends on the brand of the reloading bench. Usually, most presses of the same brand will fit perfectly. For other brands, you should find the measurements of the tabletop and compare them to those of the reloading press. What should I do in case the workbench is wobbly? A: As you can figure, this is because the legs are not in the same length. You could try cutting some of them to get them to the same height, but it could take a lot of work to disassemble the workbench. In many hardware stores, you can find rubber tips to balance the height of the legs. Is there anything I can do to help support the top? A: You could fit a support piece diagonally under the top of the workbench if you think you need it. How do I know if a press is too heavy for the reloading table? A: Most models are sturdy and designed to hold heavy objects. But if you are not sure, you can find all the different loads each table can hold on the manuals. You can find it on the internet or on the manufacturer’s webpage. What should come included with the workbench? A: Well, you can find models with a wide variety of extra accessories such as holders or hooks to hang any wire. You will definitely need to buy additional accessories since most of the ones included will be basic or simple items. As you can see, each of these models is unique in their ways, but there can only be one winner. After we went through all the information, we found that the Hopkins 90164 2x4basics stand is the best workbench for reloading in the market. Its clear manual provides you descriptive instructions to build the perfect workbench out of the box. Since this model is fully customizable, you can get creative and design a unique reloading station. You can tailor the height and length of the table, and this is great as you can also decide how much room you want the table to take. The manufacturer incorporated a durable resin that is solvent and impact resistant, ensuring that it will last a lifetime. The stable frame provides a great support for your reloading components. Plus, each shelf can hold up to 1000 pounds which is more than enough to hold all of your reloading gears. As for the downside, it may not be portable, but is as easy to disassemble as it is to bring together. Plus, you can modify the size of this unit so that it can be easier to transport. There are many excellent characteristics to it, but most importantly it gets the job done every time and it excels at doing it. It is perfect for both experienced and reloaders that are barely getting their feet wet on this art.